It's back, big time – an immensely satisfying continuation of possibly popular cinema's greatest saga. The diverse audience clapped and whooped with unbridled joy as “A long time ago in a galaxy far, far away…”, and the iconic opening crawl appeared along with the 'Star Wars' main title theme by John Williams (he’s back with new themes and rousing cues). It is the epitome of inter-generational fandom. And in the shrewd (or sly) business acquisition of ‘Star Wars’, Disney helped dispel some of the ‘superhero’ fatigue that they induced with nearly a decade of Marvel movies, by providing the tonic that we all needed in The Force Awakens. This is a reunion of characters we missed dearly, and a wonderful opportunity to take the saga in a new if familiar direction. I wouldn’t call myself a die-hard fan, but this is one of those movies which comes once every few years that you will be tempted to see it twice, maybe thrice, maybe many more times in theatres. The story continues thirty years after the events of Return of the Jedi (1983), and that is all you should know. There are new characters introduced, including Rey and Finn played by newcomers Daisy Ridley and John Boyega respectively, who you will grow to like as immensely as you did when you first saw Harrison Ford, Carrie Fisher and Mark Hamill in A New Hope (1977), all virtually unknowns at that time. 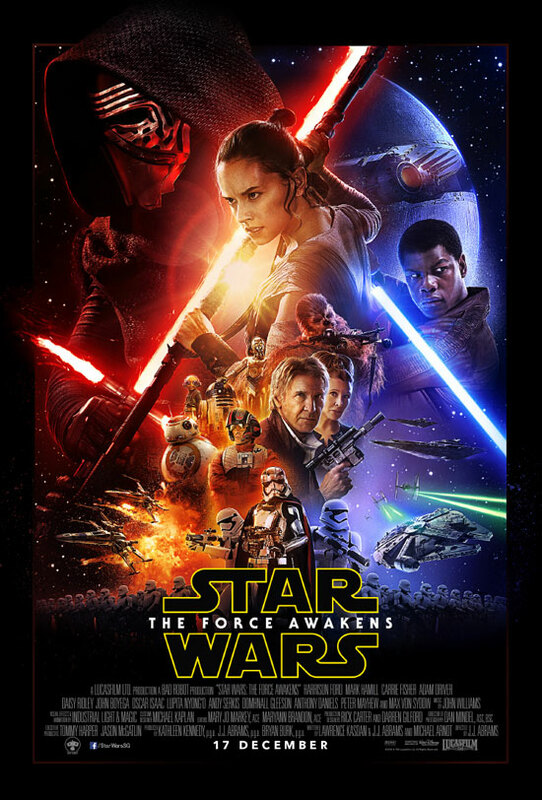 The Force Awakens follows mainly the trajectory of Rey’s journey as a desert scavenger who is inevitably thrust into the battle between good and evil, the latter represented by the fearsome Nazi-esque First Order, led by villain Kylo Ren (Adam Driver) and Supreme Leader Snoke (Andy Serkis). Fanboy director J.J. Abrams delivers with aplomb a film that we all want to see. It’s a ‘Star Wars’ movie through and through, taking most of the elements that made the original trilogy such a joy to watch (though this ‘recycling’ will probably not go down well with the more critical fans). The Force Awakens is not exactly an inspired piece of blockbuster cinema, and it doesn’t quite innovate in its own self-contained world, but it proves immensely satisfying throughout. The movie is well-paced, despite being as lengthy as the terrible The Phantom Menace (1999), and is constantly moving forward with exciting thrill-a-minute action set-pieces. Considering the hype and anticipation, Abrams and Disney can now heave a huge sigh of relief. The pressure is now on Rian Johnson’s shoulders – the next episode is scheduled for a summer 2017 release. We can only wait with bated breath. The wait is finally over – a ten-year hiatus has followed Episode III: Revenge of the Sith, but Star Wars makes a somewhat triumphant return to the big screen. The wait is finally over – a ten-year hiatus has followed Episode III: Revenge of the Sith, but Star Wars makes a somewhat triumphant return to the big screen, this time under the stewardship of its new owner (Disney) and directed not by George Lucas, but by J. J. Abrams. 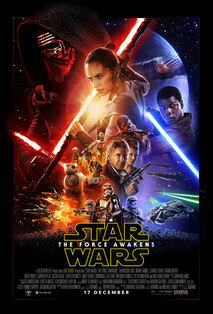 While it is a solid, very entertaining space opera, and a good start to the new Star Wars trilogy (and its spin off movies), The Force Awakens feels somewhat encumbered by the baggage of being the “true” sequel of essentially the most revered movie franchise of all time, and the exceptionally high expectations that follow such a status. Abrams has done a very good job giving fans what they expect, but nothing much more than that. Abrams has chosen to develop four new characters to succeed the thrones of Han Solo, Luke Skywalker and Darth Vader, and the casting choices are quite astute. Daisy Ridley and John Boyega are great as the heroes-to-be for the new trilogy, and Ridley is in particular a revelation. This relatively unknown British actress brings a graceful intensity and quiet strength to her role as Rey, and her performance reminds one of a younger Kiera Knightley. Boyega isn’t as commanding as Finn, but works well as a companion to Rey (somehow I am reminded of Jennifer Lawrence and Joss Hutcherson’s pairing in the Hunger Games franchise). Oscar Isaac is given significantly less to do in the show, but shows promise as the swashbuckling pilot Poe. Adam Driver is also quite memorable as the Kylo Ren, menacing and petulant at the same time, though as the main villain of The Force Awakens he comes up a little short. It is somewhat surprising, however, that the new droid BB-8 has managed to upstage everyone else in the film. Abrams pays a lot of attention to this new spherical orange and white droid, and although he has no real dialogue, BB-8 manages to express a surprising variation of feelings and emotions, even when he is in the periphery of a scene. That he is also responsible for some of the biggest laughs in the film is also just the cherry on top. BB-8’s “performance” comes close to (or even possibly surpasses) what was achieved by WALL-E’s Eve and WALL-E, which is the gold standard. Apart from drama, a good space opera should also serve up a fair share of action sequences. In this aspect The Force Awakens is a mixed bag – the first aerial dogfight (involving the Millenium Falcon) is a treat, but the remaining action sequences (yes, even the lightsaber battles) come across as being somewhat perfunctory. There’s an old-school feel to many of these scenes, which does not necessarily work in the film’s favour. While it’s not a necessity to watch the preceding six films in the franchise, The Force Awakens assumes (not unreasonably, given how ingrained Star Wars is in our pop culture) knowledge of the Star Wars universe, and doles out heaps of fan service to its fans. For a Star Wars fan like myself, it’s impossible not to feel a stir of emotions when the Millennium Falcon makes its first appearance, or when anyone from the original trilogy shows up – Han Solo! Chewbacca! Princess Leia! Artoo! Admiral Ackbar! – but I could almost sense that Abrams and team had an omnipresent checklist and was striving to check off every item by the time the end credits rolled. This slavishness to the original trilogy sometimes makes The Force Awakens feel like a reboot of the franchise instead of a sequel. This is the most critical flaw of The Force Awakens, and despite its top-secret plot and requests to keep reviews and commentary spoiler-free, there really are very few surprises to be had along the way. This lack of originality and freshness is something that many fans (including myself) would be willing to overlook, just to have the satisfaction of watching a new Star Wars movie on the big screen, but The Force Awakens is not a film that holds up very well to repeat viewings without the rose-tinted glasses of fandom and nostalgia. However, as the necessary fan-servicing is now mostly out of the way, I hope that Episodes VIII and IX will be given the freedom to explore new stories instead of retreading the old and familiar.